This Sunday some of the fittest off-road athletes in the world will be lining up on D.T. Fleming Beach in Maui for the XTERRA World Championship. They will speak Italian, French, Chinese, German, Arabic, and English. Indeed, the brightly colored crowd gathered here in Kapalua might be the most diverse group of people you have ever seen. They are so different, organizers tattoo them each with a different number to identify them. For the elites, the number will tell you what place they finished in 2016, and for amateurs, their race number will tell you which age group they are in. On Sunday, the athletes will be focused on split times, and the seconds between each other. Yet, the trip to XTERRA Worlds is about much more than just numbers. October 25, 2017 (Kapalua, Maui) – This Sunday some of the fittest off-road athletes in the world will be lining up on D.T. Fleming Beach in Maui for the XTERRA World Championship. They will speak Italian, French, Chinese, German, Arabic, and English. Indeed, the brightly colored crowd gathered here in Kapalua might be the most diverse group of people you have ever seen. They are so different, organizers tattoo them each with a different number to identify them. For the elites, the number will tell you what place they finished in 2016, and for amateurs, their race number will tell you which age group they are in. On Sunday, the athletes will be focused on split times, and the seconds between each other. Yet, the trip to XTERRA Worlds is about much more than just numbers. For Patrick McDonald, the XTERRA World Championship is about second chances. Seven years ago, while training for this race, Patrick broke his neck in four places. For April Graham, coming to Maui is a way to reclaim her body, mind, and spirit after four years of medical school and a new baby. For Louisa and Steve Webber it’s about racing together. Despite their differences, the athletes competing at the 22nd XTERRA World Championship have the same goal – to go so far beyond the numbers that they transcend their limits, and arrive at that place where they are all one tribe. 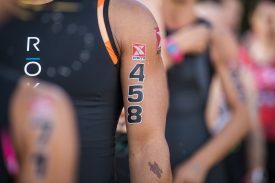 Follow the action online this Sunday at www.xterramaui.com, on twitter @xterraoffroad and live on Facebook.com/xterraplanet starting at 9am Hawaii time (12pm PST, 3pm EST, 4pm in Rio, 9pm in Paris, 3am Monday in Shanghai and 6am Monday in Sydney).